Last fall, I became obsessed with the adorable rose-shaped apple tarts that were going viral on social media. They’re so easy to make and with a light dusting of icing sugar, they make even a novice baker pass for a seasoned pastry chef. For Valentine’s Day, I wanted to make some beet and goat cheese tarts and I opted to use the same technique for a savory take on those little apple roses. It makes for a unique tart that combines sweet and savory. Served with a green salad, it’s a simple yet elegant Valentine’s Day meal. This past summer, my sweetheart went a little crazy on beets and planted several large beds of at least four different varieties. (I’ve never eaten so many beet greens in my life!) Now that winter is here, it’s fun to turn these beets into everything from juice to big pots of borscht, and lately, these elfin tarts. 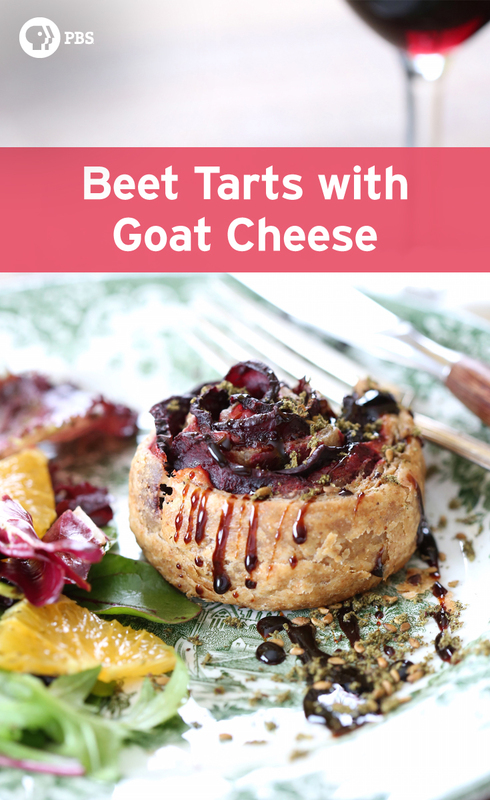 The tarts are filled with roasted beets, goat cheese, and caramelized onion. If you have access to different varieties of beets, by all means use all the colors – chioggia, golden, and red beets will make a vibrantly colorful tart! For the video, I ran out of golden beets so I went with all red, which is appropriate for Valentine’s Day, though quite not as impressive looking as the multicolored tart. A few cooking notes… If you make these tarts, do pay close attention to the recipe instructions below as some aspects of the recipe have changed since I made the video. In the video I used a whole wheat pie pastry which was nice and flaky but a little on the heavy side. Although I am generally all about whole grain flours, I’ve found that these tarts benefit greatly from a very light, thinly rolled buttery puff pastry made with unbleached white flour. Cooking them in muffin tins also helps them hold their shape. Feel free to use store-bought puff pastry if you’re short on time, but make sure it’s all-butter if you can find it. It was my sister’s idea to use caramelized onions inside the tarts and she was bang on! It really adds a lovely sweetness that complements the goat cheese and beets. 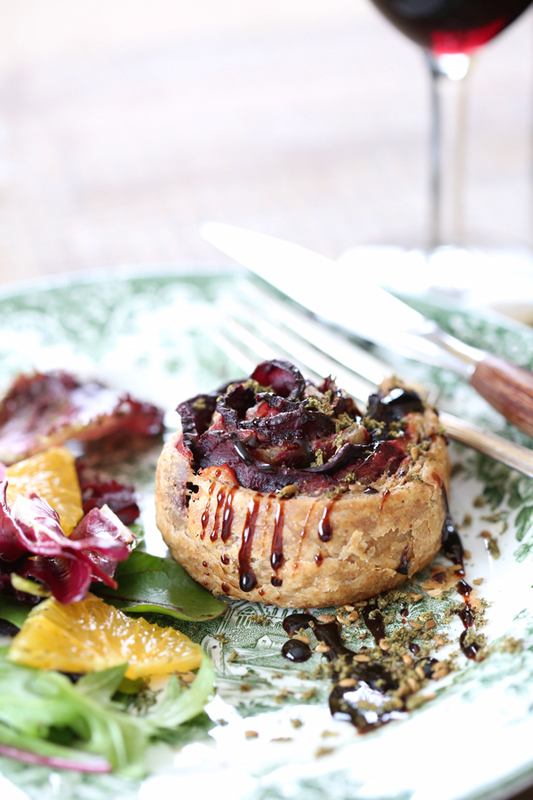 As a last note, be sure to leave a little extra time at the end to whip up a batch of balsamic reduction, it takes only 10 minutes and really completes these tarts, lending a lovely zing. (I’m so obsessed with the stuff I always make extra to eat straight out of the pot with a spoon for dessert). I like to serve the tarts warm, with a generous drizzle of thick balsamic reduction, a quick sprinkle of za’atar spice, and a green salad on the side. Roast the beets: Place the cleaned beets in a lidded ovenproof pot and drizzle with one tablespoon of olive oil, massaging it over each beet with your hands to make sure they are evenly coated. (Do not peel or remove the roots from the beets, this helps to preserve the nutrients and flavor as the beets roast). Bake the beets, covered, at 375F for about 45 minutes (smaller beets may take less time and larger ones may take longer) until a knife can be easily inserted into the centre of the beets. Don’t overcook or the beets will shrivel. If you wish, you can peel the skins off the cooled beets, or leave them on. 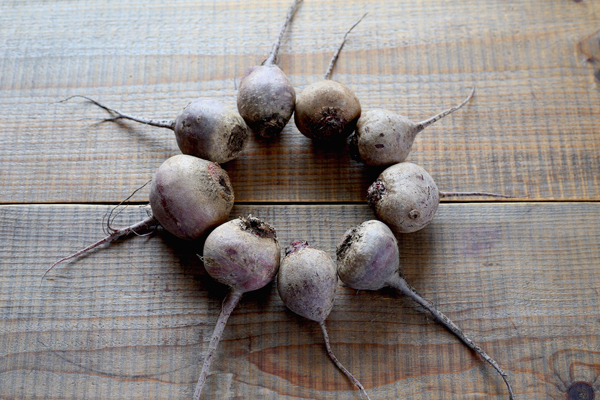 Cut the cooled beets in half, then slice them as thinly as you can, to obtain half moon shapes. It’s very important to slice them very thinly otherwise you will have a hard time rolling up the tarts. Caramelize the onions. : Trim the tips and roots from the onions, cut in half, peel, slice the onions thinly (about 1/4 inch wide). Melt 1 Tbsp butter over medium-low heat and then add the sliced onions, 1 Tbsp olive oil, and a small pinch of salt. Cook the onions over medium-low heat for about 20 minutes, checking and stirring every 5 or 10 minutes to make sure they aren’t burning. Around the 20-minute mark, when the onions are soft and turning golden, add 1 Tbsp balsamic vinegar followed by 1 Tbsp maple syrup. Stir well and continue cooking for about another 10 to 15 minutes, or until the onions have reached a good level of caramelization. Remove from heat and set aside to cool. Mix the cheese filling: Blend the goat cheese and egg together until evenly mixed and easily spreadable in consistency. Add a small dash of salt and a generous dash of black pepper. Prepare the dough: If using store-bought puff pastry, thaw out overnight in the fridge the night before. Make sure the puff pastry is cold before you roll it out. On a lightly floured surface, roll the chilled dough into a large rectangle and get it as thin as you can. (If your dough is too thick, the tarts will be doughy, and the dough may not cook through to the center). Cut into strips 12 inches by 2 1/2 inches long. You should easily get 10 strips. Keep these in a cool place until ready to assemble (if your dough warms up, it will be harder to assemble the tarts). Assemble the tarts: Spread about 1 1/2 tablespoon of cheese filling across the center of each pastry strip, staying away from the edges. Scatter about 1 Tbsp of caramelized onions and if using, 1 Tbsp parmesan across the centre of each strip. (This is a tiny bit more than what is shown in the video, but go with this). Place the beet slices down along the upper half of the pastry strip, letting their rounded edge top poke out just above the top edge. Fold the dough in half, lengthwise, to cover about 3/4 of the beets and press down gently. 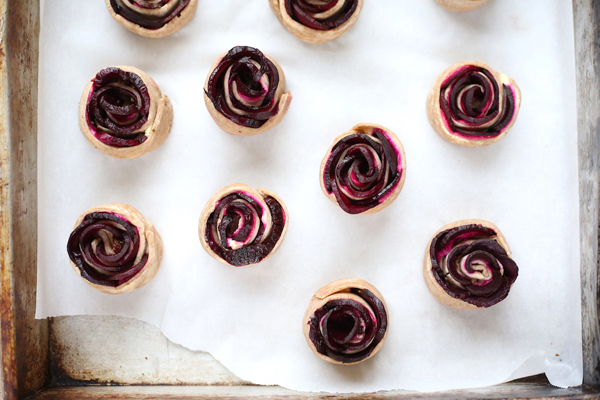 Roll the folded strip inwards on itself, until you have a little spiral round of dough and beets. Use a bit of water or egg wash to “glue” the end of the strip to the main body of the tart. (You can make an optional egg wash if you wish by whisking 1 egg and 1 Tbsp milk together and brushing it all over the outside of the pastry before baking to give it a nice golden luster). Place the tarts in a large-sized buttered muffin tin to help them hold their shape as they bake, or on a parchment paper lined baking sheet and bake at 375F for about 50 to 60 minutes, checking frequently to make sure they don’t burn. To ensure the tarts are done, break one open to check if the center of the spiral is cooked through. For the Presentation: Make the balsamic reduction by placing the vinegar and maple syrup in a small saucepan over medium heat. Cook gently for about 10 to 15 minutes or until the vinegar has thickened enough to coat the back of a spoon. (Don’t overcook as it will get thicker when cooled). 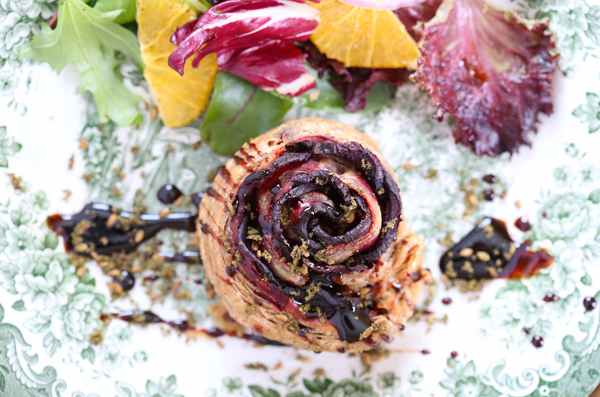 Serve the tarts warm, with a generous drizzle of balsamic reduction and if you wish, a sprinkle of za’atar spice.